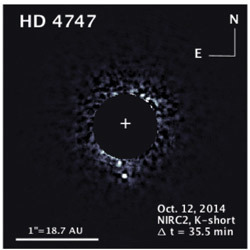 Erica Gonzales, a graduate student in the Department of Physics at the University of Notre Dame, was conducting her first telescope observations in California in October 2014 when she helped to discover and photograph a rare brown dwarf– an object with mass in between that of stars and planets. Working with her advisor, Prof. Justin R. Crepp, the Frank M. Freimann Professor of Physics, Gonzales was able to identify HD 4747 B as an important benchmark for studying objects somewhat smaller than stars. In addition to her discoveries, Gonzales recently won a National Science Foundation (NSF) Graduate Research Fellowship to continue investigation in the field. Gonzales earned her bachelor’s degree at the University of California, Santa Cruz, where she worked with Prof. Greg Laughlin, a theoretical astrophysicist who studies exoplanets. She came to Notre Dame for graduate school because she wanted to work with Crepp, who leads a new observing program that combines the Doppler method with high-contrast imaging to ascertain the mass of substellar companions using orbital dynamics. Gonzales and Crepp went to the California Institute of Technology in October 2014 to conduct observations remotely using the W.M. Keck Observatory in Hawaii. To prepare, she reviewed his database of past observations in search of a target and found that they were in the appropriate time frame to observe a suspected companion of the nearby star HD 4747. On the second half-night of observation, they collected information that, upon Crepp’s analysis, revealed the brown dwarf HD 4747 B. No other telescope had seen the object previously. Originally published by Gene Stowe at science.nd.edu on April 06, 2016.